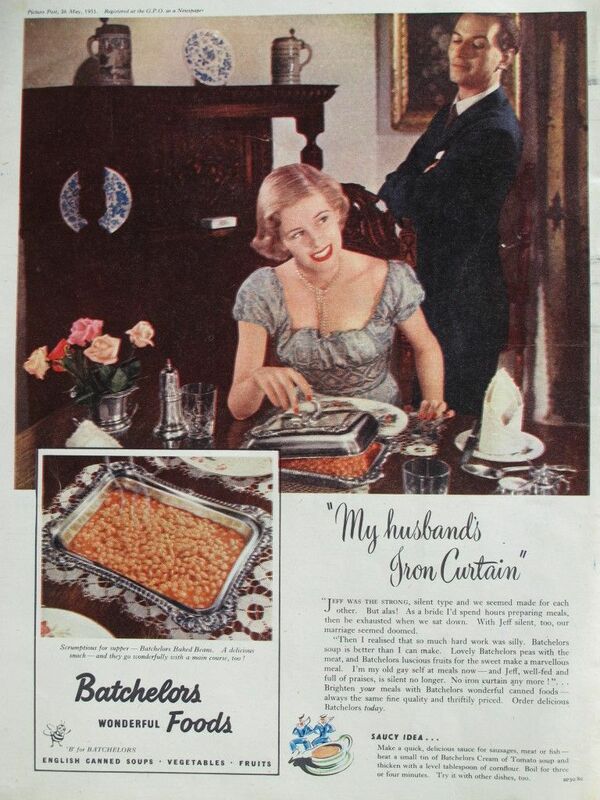 The Batchelors Foods adverts of the 1950s put across the idea that their canned products, although quick to prepare for the modern housewife, were actually the height of sophisticated dining. 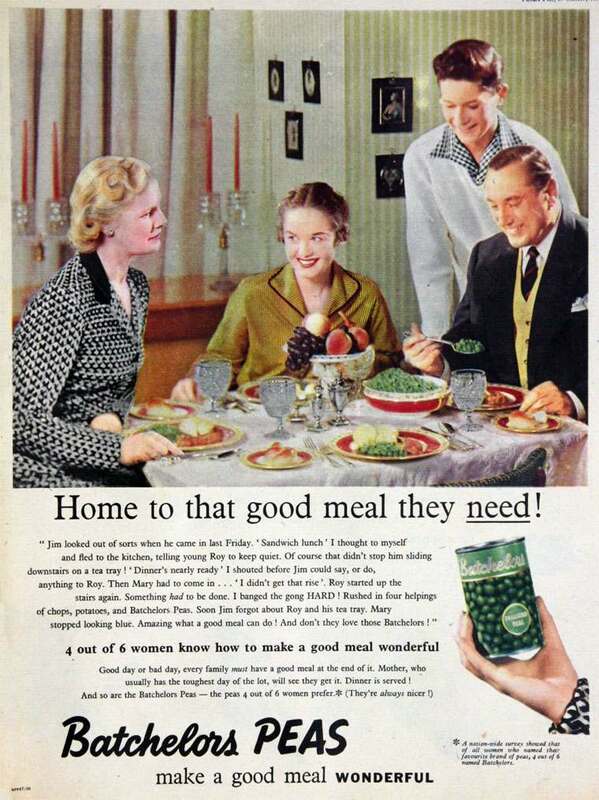 The premise seemed to be that a simple tin of peas meant minimal cooking which of course gave the housewife more time to look glamorous for her husband when he returned from work. 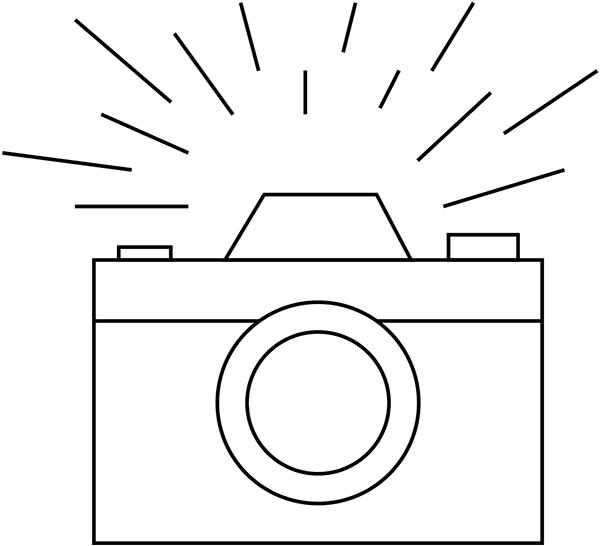 “Stay-at-home husbands are many wives’ problem – but it was the other way around at our house. 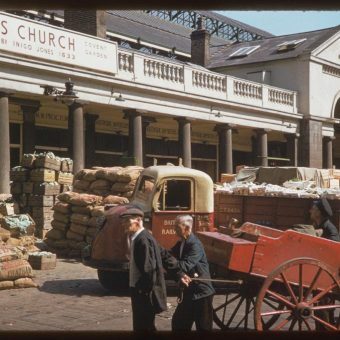 A stick-in-the-mud wife, me, always avoiding outings because of housework.” The combination of the ‘gay young Lawsons’ and Batchelors tinned Peas helped her to be a better housewife. Batchelors Food ad from 1953. 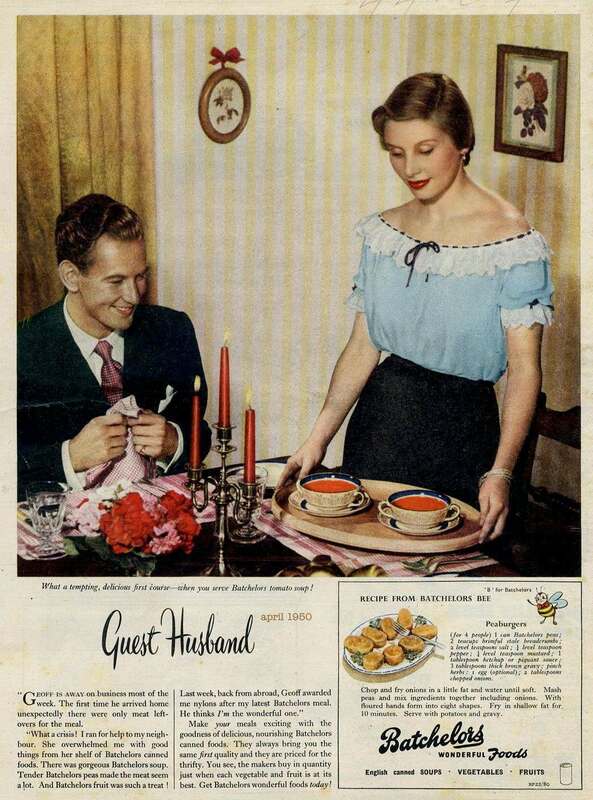 The Batchelors Foods adverts of the 1950s put across the idea that their canned products, although quick to prepare for the modern housewife, were actually the height of sophisticated dining. 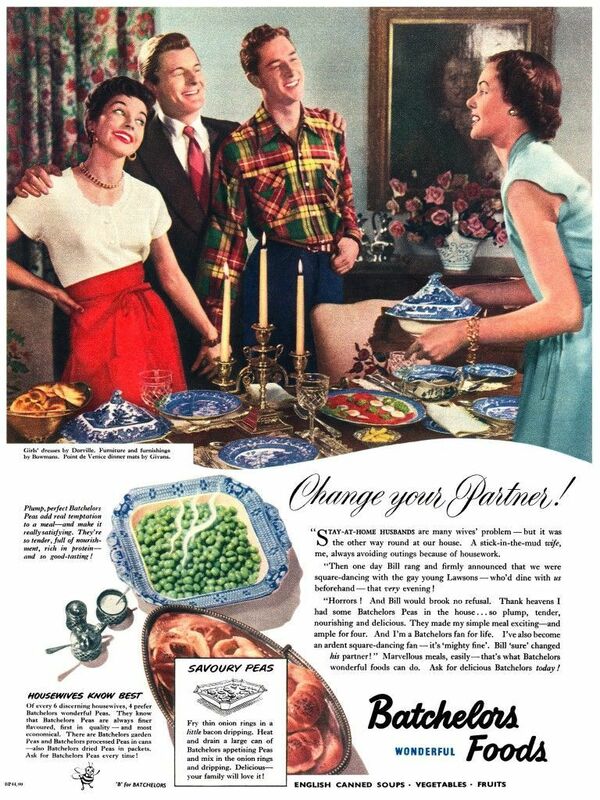 The premise seemed to be that a simple tin of peas meant minimal cooking which of course gave the housewife more time to look glamorous for her husband when he returned home from work. After World War 2 a study showed that the average British housewife worked 75 hours a week with a quarter of that spent in the kitchen. 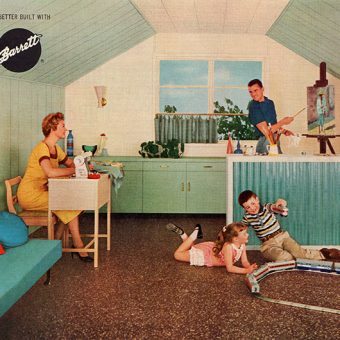 It wouldn’t be until the 1960s that washing machines and refrigerators started to become common in British homes. Housewives were desperate for any sort of labour-saving devices and speedier, simpler ways of cooking meals. In 1951 at the Festival of Britain huge queues of people were attracted to the Home of the Future’ exhibition which featured modern fitted kitchens and newfangled electrical appliances galore. Housework drudgery was a fact of life to most women in the post-war servant-less house. 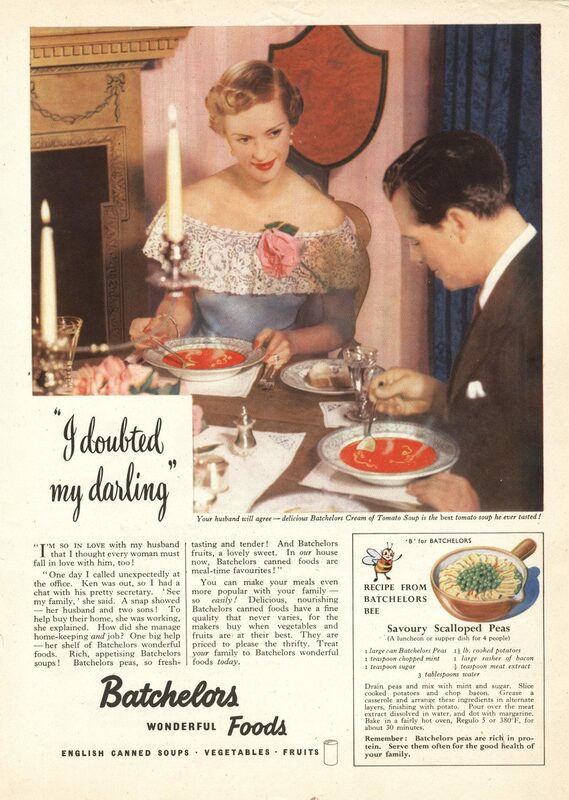 These classic Batchelors Foods ads of the fifties soon affectionately gained the name ‘soup operas’. “Last week, back from abroad, Geoff awarded me nylons after my latest Batchelors meal. He thinks I’m the wonderful one.” Ad from 1950. “I doubted my darling”. A housewife asks her husband’s pretty secretary how she holds down a job and does the housework too. 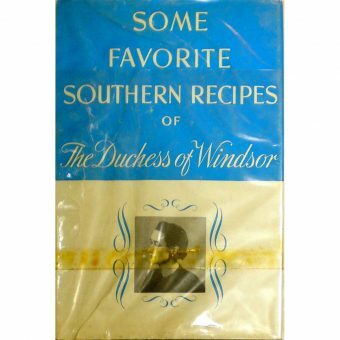 Batchelors canned food is of course the answer. 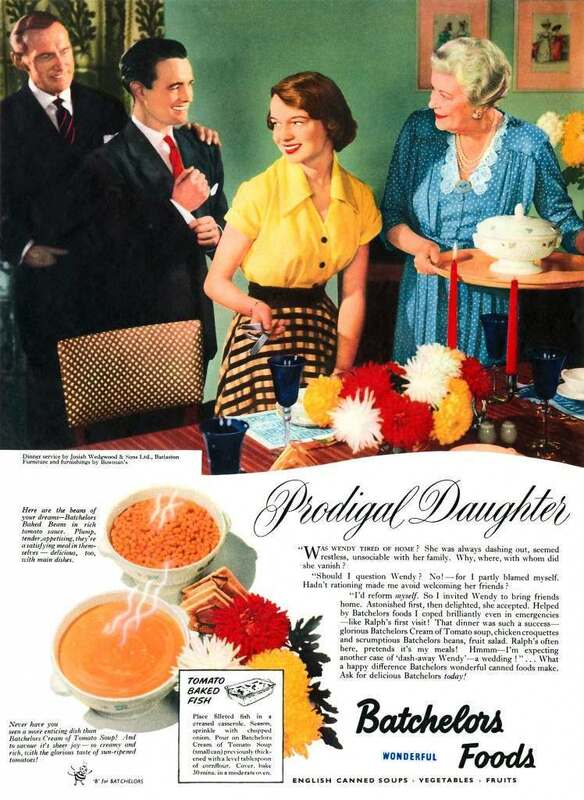 “Prodigal Daughter” .A housewife cooks a meal involving Batchelors baked beans for her daughter Wendy’s boyfriend. Now a wedding is on the cards. Ad from 1953. “My husbands Iron Curtain” – Housewife becomes her old ‘gay self’ again when she starts cooking with Batchelors. Her husband, now well-fed and full of praisers is ‘silent no longer’. 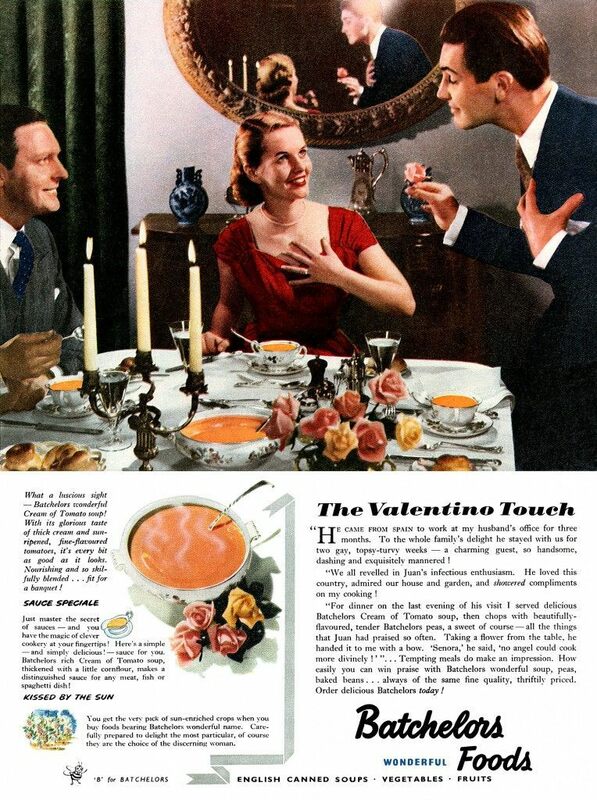 “The Valentino Touch” – A very creepy Spanish houseguest pretends to like a housewives cooking when she serves up some tinned Cream of Tomato soup. Ad from 1952. 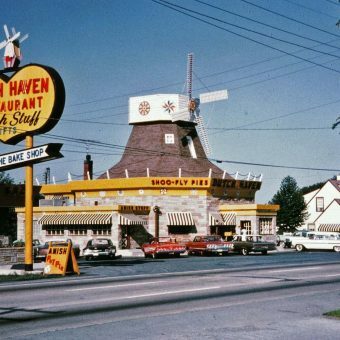 “Home to that good meal they need!” – Jim looked out of sorts when he came in last Friday. ‘Sandwich lunch’ I thought to myself and fled to the kitchen. Ad from 1951.